What is a MOV File? Developed by Apple Inc., MOV format is largely used to store video files, especially movies, audio files. It is the file extension that is used by the QuickTime media software and iMovie. The MOV file format was initially developed by Apple, although it is now compatible with both Windows and Mac operating systems. However, if you want to play these MOV files on other media players as well, you should convert MOV to video formats which are supported by these players. Thus you need MOV Converter for Mac/Windows. Here recommend you two pieces of MOV Converter, Video Converter for Mac and Video Converter for Windows. They can convert MOV to other video formats such as FLV, WMV, AVI, MP4, VOB, MTS and vice versa. Why is MOV Converter for Mac/Windows Necessary? You may encounter some of these situations to convert MOV to other video formats or convert video to MOV. Video Converter for Mac/Windows is used to fix the format incompatibility issues. Convert MOV to FLV: Need to share or upload MOV video on sharing websites like YouTube or Google. You should convert MOV to FLV since FLV is the supported format for this websites. Convert MOV to WMV: If you want to play MOV on some WMV-based program or WMV supported devices like BlackBerry, you need to convert MOV to WMV or you will fail to play them. Convert MOV to AVI: AVI is playable on most portable devices like Nokia, Xbox, Blackberry, PSP. You want to enjoy your MOV video on these portable devices but find it incompatible. Convert MOV to MP4: Most portable players like iPod, iPhone, PSP, PS3, Archos, iRiver PMP, Creative Zen and Apple TV (720P HD) support MP4 format. You may want to play MOV videos on these portable devices but find them unplayable. Convert MOV to VOB: Want to convert MOV to VOB or DVD format to burn a DVD of it and then play it on DVD Player. Convert MOV to MTS: Want to play videos in MOV format on digital photo frames such as on Sony, Canon, Panasonic but find them incompatible, so convert them to MTS. Convert video to MOV: Need to play video in FLV, WMV, AVI, MP4, VOB, MTS format in QuickTime or edit them in iMovie. You should convert them to MOV since MOV is the supported format of Mac OS X. 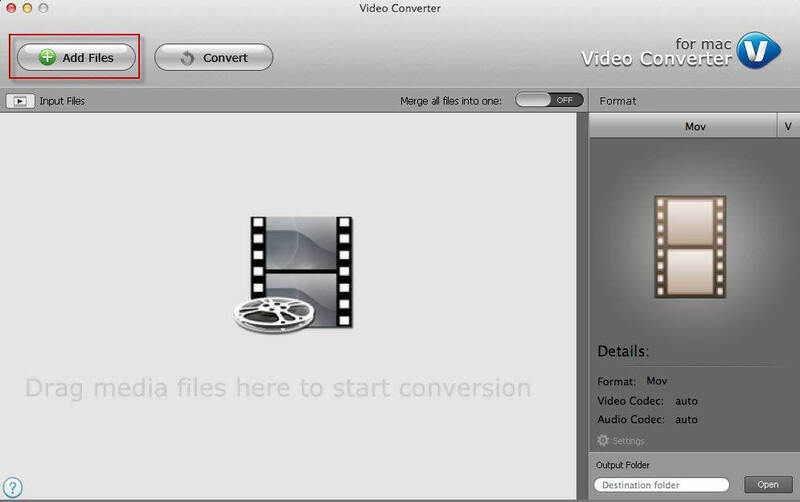 How to Convert MOV Files with Video Converter for Mac/Windows? Here will show the overall steps for performing MOV Converter for Mac by the best Video Converter for Mac. However, for Windows users, go to how to convert MOV in Windows 8/7/XP/Vista here. Step 1. Load MOV files by clicking "Files" to add videos. Or drag them into the interface directly. Step 2. Select an output format from FLV, WMV, AVI, MP4, VOB, MTS etc. Step 3. Click "Open" to choose an output file folder. Then click "Convert". Thus you have learnt how to apply for Video Converter for Mac and Video Converter for Windows to do MOV converter.